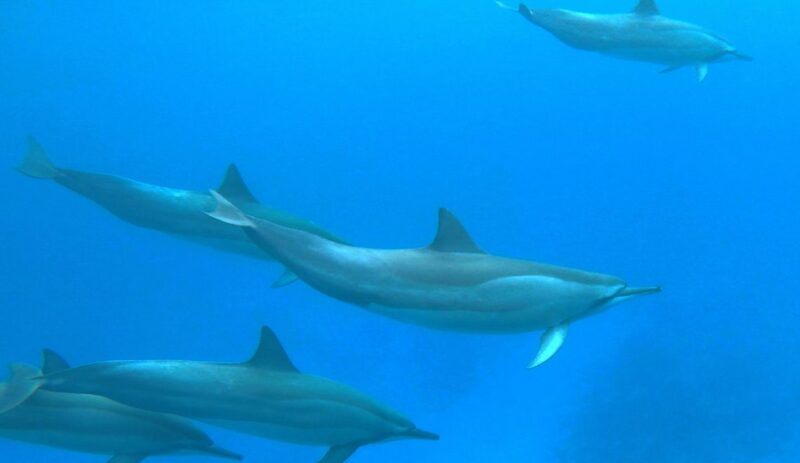 I was recently in Kona, Hawaii and was ecstatic to find that you could book a tour to swim with wild dolphins. After digging a little further I found that swimming with wild dolphins was a bit of a heated topic. 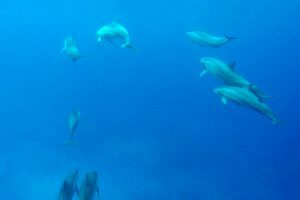 Here is some information to help you decide whether or not to swim with the Hawaiian Spinner Dolphins on your upcoming trip to Hawaii. The spinner dolphins swim out into deep waters to hunt at night and come back to the shallow coastal areas during the day to get their rest. The time when they are traveling between hunting and resting areas is when they are said to be the most playful. Some scientists are becoming concerned that human interest in the spinner dolphins during their rest periods may be harming them. Specifically, the concern is that the dolphins are spending too much energy either engaging with curious humans or swimming away from their boats. We all know that a good nights rest is what helps us to function during the day and the same is true for dolphins. Disturbing their rest may lessen their ability to hunt or to stay alert for predators while looking for food in deeper waters. There are not currently any regulations prohibiting tours to swim with these dolphins. If you do choose to take a tour, as I did, I’d encourage you to be mindful of these concerns for the dolphins well-being when choosing which tour company to use. What Tour Company Should You Use? I booked my tour with Dolphin Discoveries and felt that they were very respectful of the spinner dolphins that we encountered. The tour was 4 hours and was timed so that our dolphin encounter would occur during the playful time between hunting and resting behaviors. This is good for the tourists (playful dolphins) and for the dolphins (not interrupting their rest). Our captain made clear that once we found the dolphins, we would only have three chances to swim with them. 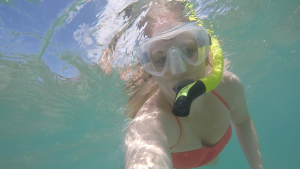 If the dolphins did not stick around on any of those three chances then we would move on to a snorkeling site to see coral and colorful fish. We would not harass them if they were not interested in swimming with us. When we found the dolphins, it was not going to be a free-for-all of tourists jumping right into the middle of the pod. We weren’t going to scare or alarm the spinner dolphins. We first observed the dolphins from the boat, trying to determine which direction they were swimming. The captain would then position us well ahead of the pod and stop the boat. We would get into the water very far from the dolphins and hope that they would continue their path towards us, making it very easy for the dolphins to detour if they were scared or uninterested in interacting with us. I will note that there were some other tour boats in the area that clearly had different priorities. Their tourists would jump right into the middle of a pod of dolphins. I’m sure this would be very exciting for the humans, but is obviously not prioritizing the dolphin’s experience. Lastly, our captain made abundantly clear that if a dolphin was near us we were not to reach out to try to touch them or attempt to free-dive down below the surface to get closer to them. The comfort of the dolphins was top priority. Should You Swim With Them? Some people argue that any tour, regardless of their ethics and behavior, may be harmful to the spinner dolphins. I don’t know whether or not that is true. I felt comfortable with the tour that I booked and did not feel like we were harassing the dolphins in any way. Then again, I’m not a marine biologist. I would like to hope that in the future there will be regulations in place to help clarify which human interactions are harmful to the dolphins. If that means stopping all tours, then so be it, because the dolphins needs should certainly be prioritized over our entertainment. In the meantime, if you do decide to swim with the dolphins I hope that you’ll do your research before booking a tour. Make sure you choose a company that agrees that these dolphins are special and should be respected. Have you decided to book a “swim with dolphins” tour in Kona? If so, I’d love to hear what tour company you used and how they treated the dolphins you encountered. Let me know in the comment section below. I agree that you want to consider researching ways to not harm dolphins before you swim with them. 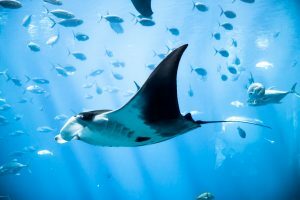 It would be good to consider ways to swim with them and not harm them. My sister is planning to swim with dolphins in Hawaii, so she’ll have to do some research first.